Those seemed like rather bold claims, which as far as I could tell were not supported by the available evidence. It turns out the Advertising Standards Authority agrees with me. I reported the advert last year, and last week the ASA finally ruled on my complaint, which they upheld. It’s worth reading the ASA’s ruling in full. They were very thorough. They came to similar conclusions that I did: that although there was some hint of activity against a cold, there was no evidence of activity against flu, and even the evidence for a cold was not strong enough to make “clinically proven” a reasonable claim. While the ASA get good marks for being thorough, they get less good marks for being prompt. It took them 11 months to make this ruling, which allowed Boots to continue misleading customers all that time. I suppose being thorough does take time, but even so, I’m disappointed that it took them quite as long as it did. Boots are now no longer advertising Boots Cold and Flu Defence Nasal Spray on their website. They are, however, advertising a spookily similar looking product called Boots Cold Defence Nasal Spray. Although they have now dropped claims about flu, they are still claiming the product is “clinically proven” to both treat and prevent colds. It is not clear to me whether this is the same product that’s just been rebranded or whether it is something different. I note that it says the active ingredient is carrageenan, which was the same active ingredient in the previous product. 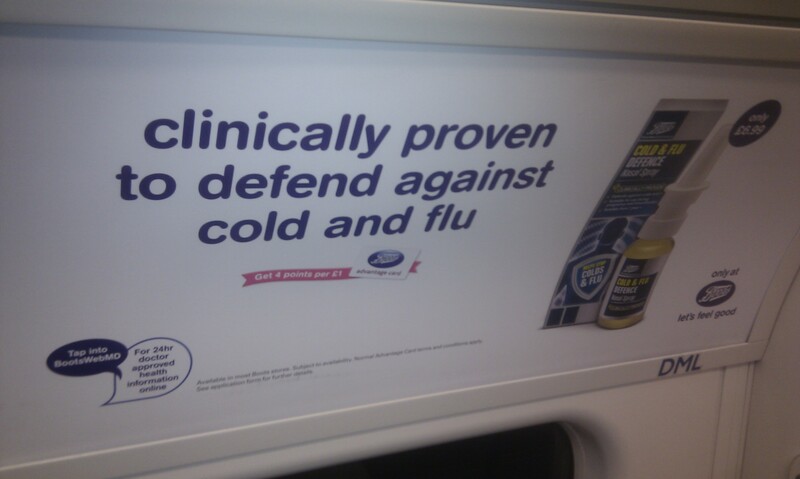 If it is the same product, then it’s good to see that they have dropped the flu claim, as that was totally unsupported. However, the cold claim is just as dubious as before, unless they have done new studies in the last year. I have been in touch with the ASA about the Cold Defence product, and they have told me that since it’s a different product (or at least has a different name) it wouldn’t be covered by the previous ruling. If I felt that the claim was unjustified it would need a new complaint. Is it just me who thinks Boots is being a bit cynical here? Unless the new product is something different that actually has a robust evidence base, they must know that the claim that it is clinically proven to treat and prevent colds does not stack up. But they are making it anyway. No doubt safe in the knowledge that by the time the ASA gets round to ruling on it, this year’s cold season will be well and truly over, and they will have had time to mislead plenty of customers in the meantime. If the new advert is also found to be misleading, there will be no punishment for anyone at Boots. The worst that will happen to them is that they will be told to change the advert. Why are big corporations allowed to mislead consumers with impunity?